I know there are a lot of Harbor Freight dust deputy projects on here… But I think I approached mine a little different. 5) Short enough to fit under open garage door and track. I did not want to buy/use a lot of adapters, so I tried to come up with a way to hook the fan directly to the cyclone. This will help save money and should minimize the resistance in the system. Instead of cutting the metal side plate of the fan to a 6” opening to match the SDD, I decided to make my own motor plate from plywood. I removed the metal side panel w the 5” intake from the blower. My thought was to pattern match the bolt holes from the original cover and use my router to cut a perfectly fitting hole for the outside of the SDD. To get enough material thickness to match most of the top of the SDD, I ended up glueing a 1/4” and 3/4” piece of plywood together and later added another 3/4” later. This is a total of 1.75” thick of plywood motor plate at the top of the SDD. 6.125” diameter w my trammel made for a snug fit. I applied a little silicon on the SDD sleeve and between the last 3/4” piece of plywood and the motor plate to seal the top. I had to purchase longer (6mmx20mm) bolts. I slightly countersunk the holes so the top of the bolts were not sticking up. I am happy with the direct connection between the SDD and the HF motor. The top of the SDD sits just a little below the blades of the fan. No extra long transitions or curved pieces between the two. 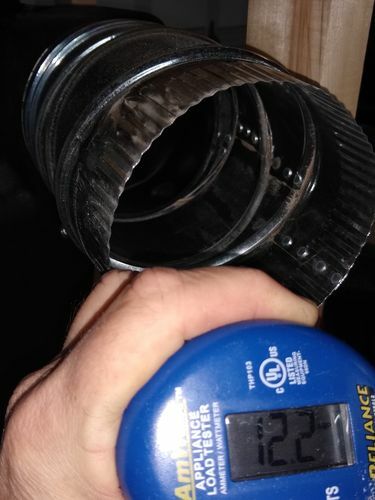 The blower has a very short (< 1/2”) straight 6” connection to the SDD. The bottom of my DC is a sealed box to house an aluminum trash can. The front side has neoprene weather sealant on the inside and is hinged to gain access to the can to empty it. The frame is just stud grade 2X4’s that I ran through the planner and table saw to clean up the sides and square them up. The door is a piece of 3/4” ply, the sides are 1/4” and the back is 1/2” ply. The various sizes are basically due to what I had in the garage. I glued and screwed all the pieces together thinking the glue would help make the joints air tight. I used a caulking gun to seal all the joints, also. The top of the box has a 6” hole to match the bottom of the SDD. The SDD is bolted and sealed to this directly. Once again, no transition pieces. The 2X4’s making up the frame were sized so they would place my homemade motor plate just above the top if the SDD flange. I uploaded a couple pics trying to show some details of the motor plate. I made quite a mess in the garage making this DC stand between the jointer, mitersaw and table saw. I currently have it discharging directly to my garage unfiltered. 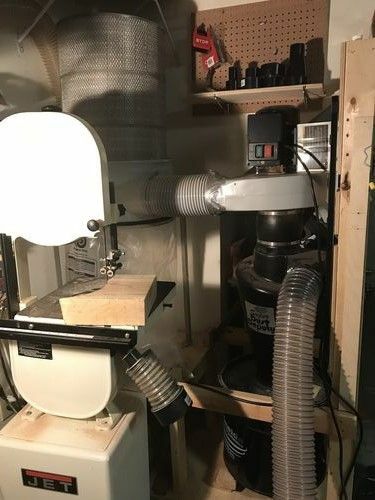 Even without a discharge filter or bag, there was no dust cloud when I vacuumed up large amounts of saw dust and shavings. I vacuumed up enough to fill the 33 gallon trash can almost half way. I was extremely happy with the performance of this setup. I was very surprised that the saw dust was captured in the cyclone and not blowing back into my garage. Right now, I am using a HVAV 5” transition piece on the inlet, that reduces to 4” to fit my flex hose. 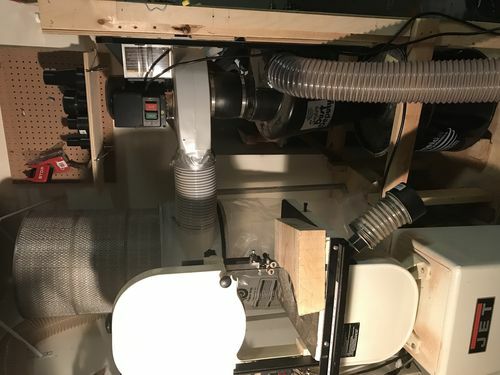 I plan to use 5” ducting to bring the suction down to the bottom of the mobile cart and use 5” flex ducting to hook to my tools. I have a small shop that is more often used as a garage, so I will just hook up to one tool at a time and not run permanent ducting. A ten foot length of flex hose will be more than long enough for me to place my DC and be able to reach most of my dust producing tools. The next stage is to build a discharge plenum. I’m going to line the inside of the plenum w old carpet to help muffle the noise. Initially, I am going to use my trammel to make a wood ring to match the HF filter bag. The bag will hang down below the plenum. Eventually, I would like to get a proper cartridge filter (Wynn or equivalent) on the discharge. The whole thing will be attached to the same cart for easy storage and setup when needed. Good call. I did something similar with a Delta 50-850. I kept the bag assembly and added a Wynn filter. 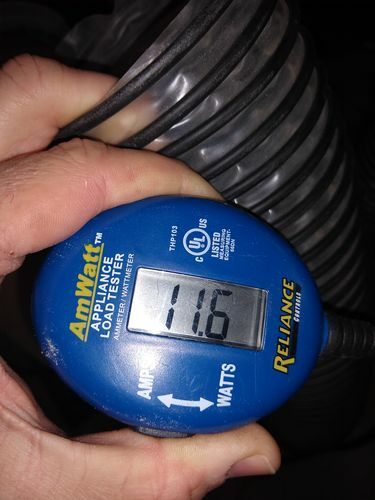 If you aren’t going to attach a filter, be real careful to monitor how full your trash can is getting. Once it is full, it will start shooting debris out of the blower discharge like one of those chippers the highway dept uses! I would strongly encourage you to put some sort of plywood plate with a good filter attached to it on the discharge. You won’t degrade your airflow too much, and the dust you will be catching is the real bad kind. I do plan to add something to the discharge. Ideally a cartridge filter, but might need to wait for funds. In the meantime, I think I will make something to hold the original HF pillow case type filter. I have another tip for anyone making something similar. The DC needs to be air tight below the cyclone. Any air path below the cyclone discharge will reduce the effectiveness of the cyclone and lead to more dust getting blown out the discharge. I did an old mechanics trick for finding vacuume leaks on an engine. I used a mechanic stethoscope w the probe removed (just the air tube) and listened around every seam and joint. A piece of small diameter hose held to one ear works ok if you don’t have access to a mechanic stethoscope. I located a couple leaks at the edges of my door and one at another seam. I blocked the suction while looking for the leaks, thinking the stronger suction would amplify the leaks. I applied some sealant to those spots and will test again once it cures. Nice design. I will recommend this to my friend who is just beginning to buy the pieces he needs for a HF SDD combo system. Ken, Nice job and congratulations on your ‘Daily Top 3’ award. I used a lot that I had laying around for the build. I had an idea in my head, but it evolved during the build. But, here is a rough list. 2. About 6 stud grade 2×4’s. Ran over jointer and through table saw to square up sides and make them look nicer. 5. Trash can (Could also just create something to hold a large trash bag in bottom box). 8. Weather stripping to seal the door. 10. 12 – 6mm bolts to bolt on new wooden blower side cover. I used 20mm length and counter sunk them slightly. 11. 5” HVAC adjustable elbow. Used for inlet to SDD. I drilled the rivets at one end to allow it to open slightly to slip over the SDD inlet. 12. 5” band clamp to hold #11 to SDD. I used one that came on original HF discharge hose, since I was not planning to use that portion. 13. Built on top of original HF cart. I was going to remove the casters and put them on my cabinet, but it works good as it is and I did not want more holes and possible air leaks. It’s very stable even though it is just sitting on the original metal cart. 13. 5” to 4” HVAC adapter (from Lowe’s). Only because I had 4” flex hose already. If doing from scratch, I would get 5” flex a hose and reduce if needed directly at the tool to minimize air flow resistance. 14. Probably 2 sheets of plywood. I used leftovers I had in the garage (1/4, 1/2 & 3/4”). I think that covers all I used. I had the HF DC for a couple years w a trashcan separator lid. I wasn’t happy with the lid. I donated it to someone at work and built the new system around existing motor and trash can. In case anyone has questions about the HF motor running w my modifications. 12.2 amps w nothing connected to the 5” suction on the SDD. By the way, my DC was previously modded w the larger Rikon impeller.